TGIF -- I am so glad today is Friday! This evening I was in the mood for comfort food...so that's what I made, with a twist. I made Thai Style Coconut Almond Crusted Chicken using chicken breast cutlets and a crust mixture that included actual coconut this time (unsweetened), not coconut flour. What a difference that made -- you could actually taste the coconut flavor and the little bit of crunch from it. It gave it a whole different texture and both hubby and I liked it a lot. I also sauteed it in coconut oil which further enhanced the coconut flavor. Our side dish was Cheddar Cauliflower Mash that was absolutely out of this world. I based this recipe on one made by The Neelys from the Food Network. It is essentially their recipe with a few very tiny modifications. 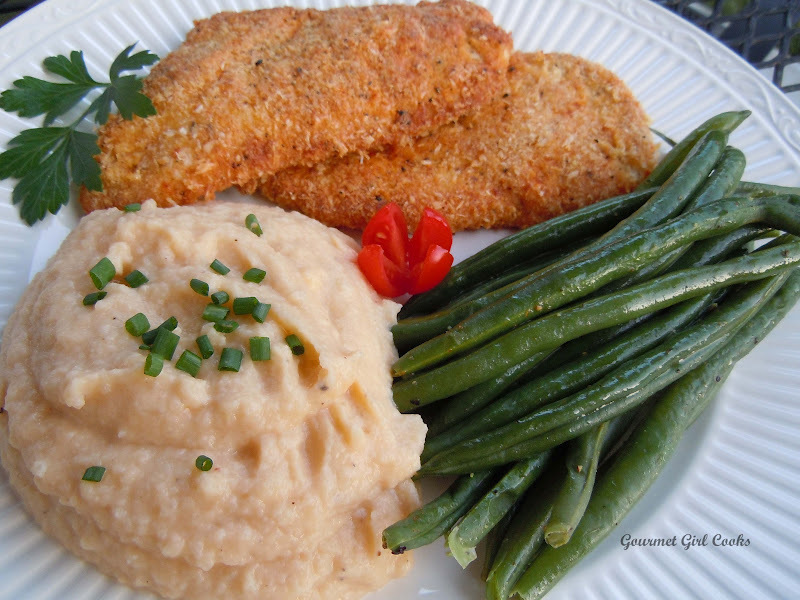 So far, of all the mashed cauliflower recipes I have tried or just thrown together, this one is my favorite. The cheddar flavor is strong enough that you almost think you are eating "mashed macaroni and cheese" instead of cauliflower...it is awesome. I also steamed some fresh green beans with a little butter for our veggie. This dinner wasn't just comfort food...it was a really delicious meal. These recipes are most definitely "keepers". I snapped a few photos for you to see below as well as the recipes. Enjoy! 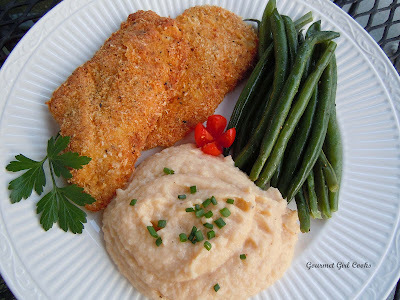 In a shallow bowl or plate, mix all breading ingredients together well. In a separate bowl, beat all egg wash ingredients together. 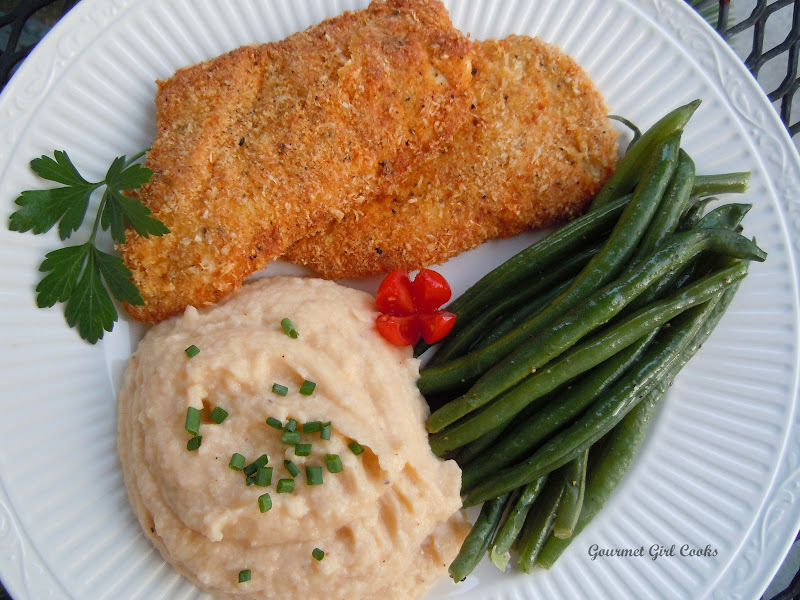 Dip each cutlet into the egg wash mixture and let excess drip off; lay cutlet into the breading, turning until both sides are evenly coated; set aside on a plate and repeat until all cutlets have been breaded. In a large non-stick skillet, melt a couple tablespoons of coconut oil on medium-high until hot (it's hot when a drop of water sizzles). Add cutlets and cook for several minutes (approximately 3-5 minutes); turn over when golden brown and repeat on the other side. Place cooked cutlets on a paper towel lined plate to drain excess oil. Lightly dust with paprika, salt and pepper, if desired. Serves 1 to 2 cutlets per person. Place cauliflower and chicken stock in a medium sized saucepan. Cover and bring to a simmer of medium-high heat and cook until completely tender (about 10-15 minutes). Most of the chicken stock cooks down while the cauliflower cooks. Add garlic powder, salt and pepper, to taste; stir in cream and puree with an immersion blender until completely smooth (or use a food processor). Stir in the cheese and mix well until melted and well blended. Stir in sour cream and taste to adjust seasoning. Serve garnished with snipped fresh chives, if desired. Makes about 3 generous servings.